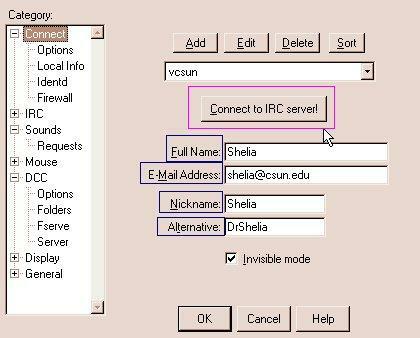 Once you are connected to the vcsun server, a welcome message will appear in the status box. The mIRC Channel Folders dialogue box will appear. If it does not appear, select it by its icon and it will open. To have it automatically open when you join lrc, enable the Pop up folder on connect option at the bottom of the window. To add a channel, type the name where requested and click on Add. The name will then appear with the other channels that have been entered. To join a channel, highlight that channel from the list and click on Join. As soon as you Join the channel, a channel dialogue box will open with the name of the channel at the top and the names of the people on that channel listed on the right. Whoever starts the channel will have a special sign in front of their name. This indicates that they are the Ops. Automatic logging allows you to automatically log channel and chat automatically whenever they open. From the channel window, you can enable the logging feature. Click on the left corner of the window and a drop-down menu will appear. To enable the logging, click on it and a check will indicate it is on. In the Automatically log area, select the options you want to automatically log when you connect to the server. You can log channels and direct (DCC) chats. In the area below that, the location of logs and buffers saves: indicate where you want those logs to be recorded. I suggest you create a separate log directory before you start logging activity. and another box will open. This box will ask you to indicate where you want the log to be saved. 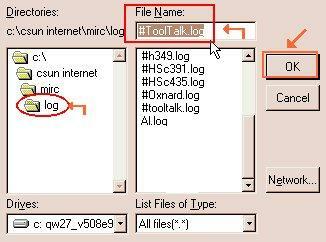 During the install process, a log subdirectory was created and that will be the default. Unless you want to save it to a different directory leave that. The file name automatically given will be the name of the channel or DCC that you are saving. Once again, unless you want to assign a different name, accept the default. Remember, when a log is saved in mIRC it will append to the existing log and not overwrite if there is an existing log with for that channel or DCC. You can view and delete any log files which are listed in your Logs and Buffers directory. 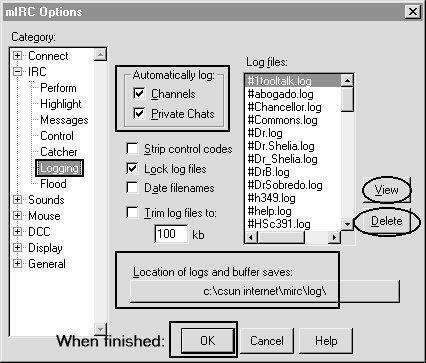 From this File|Options dialogue window, you can view and delete any log files which are listed in your logs and buffers directory by simply highlighting it and select either View or Delete. Each time you return to a channel or chat, the log is appended to and not erased. Take a look at a log from two Virtual Office sessions. There is also a feature to allow you to post the log to the Internet. A real-time log can be created using Webpup, a web bot. 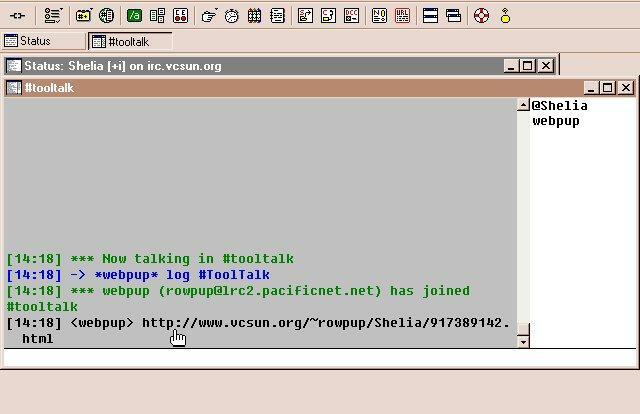 To create this log you send a message to Webpup and will respond by telling you he has joined the channel and the address for the log. In mIRC5.5 and later, this is a clickable link that will open in a browser window. In earlier versions, to copy the address you mark the text as usual with the mouse by pressing the left mouse-button and dragging it. The moment you release the left mouse-button, the text will be copied into the clipboard. You can then do the usual Shift-Insert key combination to paste the text in your browser. This is a real-time log that is created as the discussion goes on. To view the latest comments you must Reload or refresh the page frequently during the session.